It would really be nice just to eat what I want, or even just to eat what was good for me. 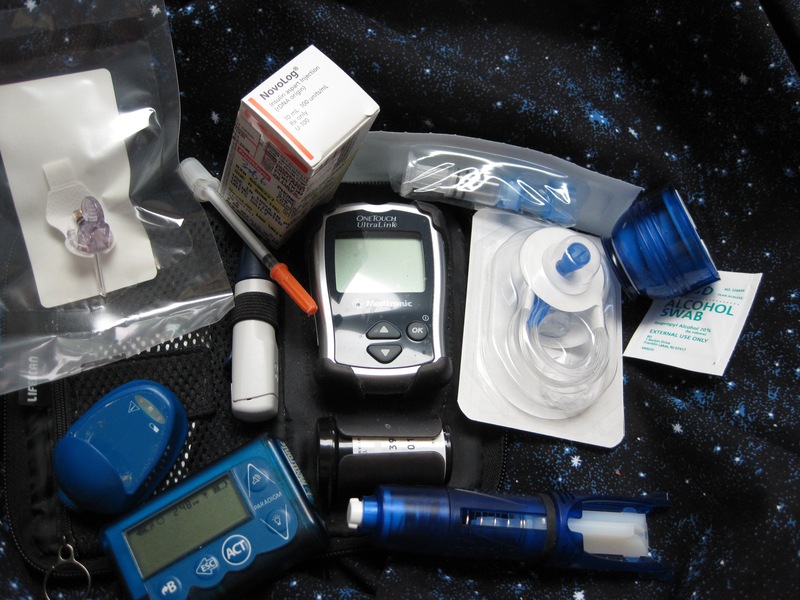 But when you’re using an insulin pump with carbohydrate counting, things are never that simple. 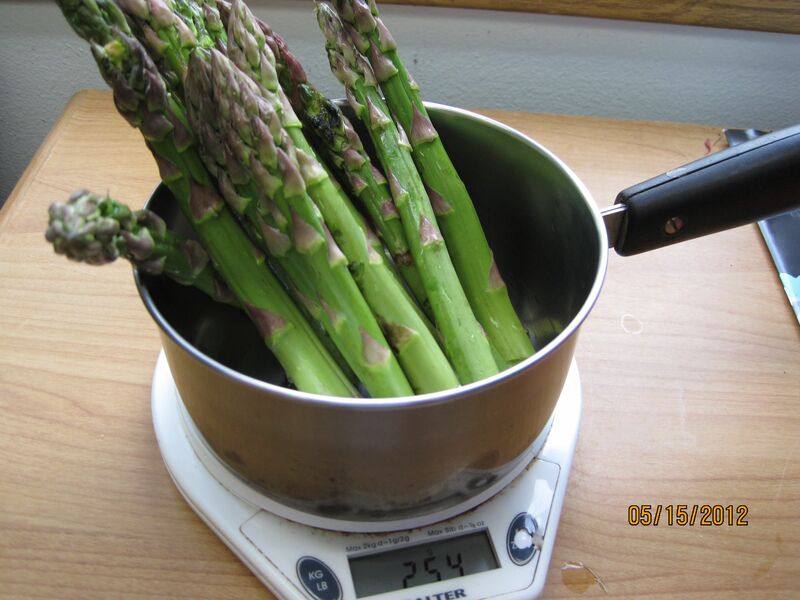 The scale was tared for the weight of the pan; only the asparagus is weighed. This is only 6 grams of carbohydrate; asparagus is not a high-carbohydrate food. Carbohydrate counting is a relatively complex way to handle the interplay between food and insulin. The simplest way, which is what the doctors started me on 40 years ago, was a rigid diet (the diabetic exchange diet) and an equally rigid schedule of insulin shots. It worked all right during the honeymoon phase, but few people stick to it, and by 10 years ago it wasn’t working. Even when I tried counting carbohydrates to get a more accurate food intake, the intake being dictated by my doctor, I still had problems. Sometimes I would go into shock at the most unexpected times (including while eating); at other times I would go high for no apparent reason. It wasn’t until I got an insulin pump that I learned the most important lesson of carbohydrate counting: you adjust your insulin to what you are eating, your measured blood sugar at mealtime, and how your body reacts. Some doctors are still not comfortable with this. But how do you get those grams? If you’re eating prepared food you read the nutrition label. These are actually available online for many national restaurant chains, though it means going online before you go out to eat, or order it sent. (It may also shock you at the amount of fat present.) If you are eating out other than at a national chain, you have to guess – and check your blood sugar often after eating. If you are cooking with fresh food at home, you need to weigh everything and refer to some kind of list, such as the one put out by the FDA, which has nutritional information for all kinds of foods. (The FDA list is available as an iPhone app, and there are may other food listings of this sort online.) Needless to say, this greatly slows down the process of preparing a meal, which is why I tend to rely rather heavily on frozen meals – reading the nutrition labels before I buy! As to how to weigh food, the ideal is a gram scale, usually digital and battery-powered. Mine’s almost worn out from use, but it’s an essential part of food preparation for me. As to getting all those weights into a meal, I use a computer program called Diet Sleuth, though it means running back and forth between the kitchen and the computer room to enter the foods I’m going to eat. Next week I’ll describe how it works. Well, I’ve had a couple of good days. 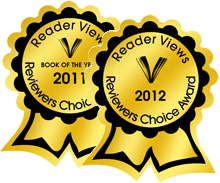 First was the email Thursday that Tourist Trap was a finalist in the Reader Views Literary Awards. Yes, that’s the same one Homecoming received last year. Then I got a phone call from the clinic saying the box of replacement sets had arrived, and I picked them up Friday, thus ending a very nervous couple of weeks. The other end of that plastic cord feeds into me. I use an insulin pump. It’s about the size of a small stack of business cards, and it normally lives in my pocket. It contains a reservoir of insulin, which theoretically should be changed every three days. (I normally average about six, because that’s how long a full reservoir lasts me, and I have yet to see any drop in effectiveness after six days at body temperature.) 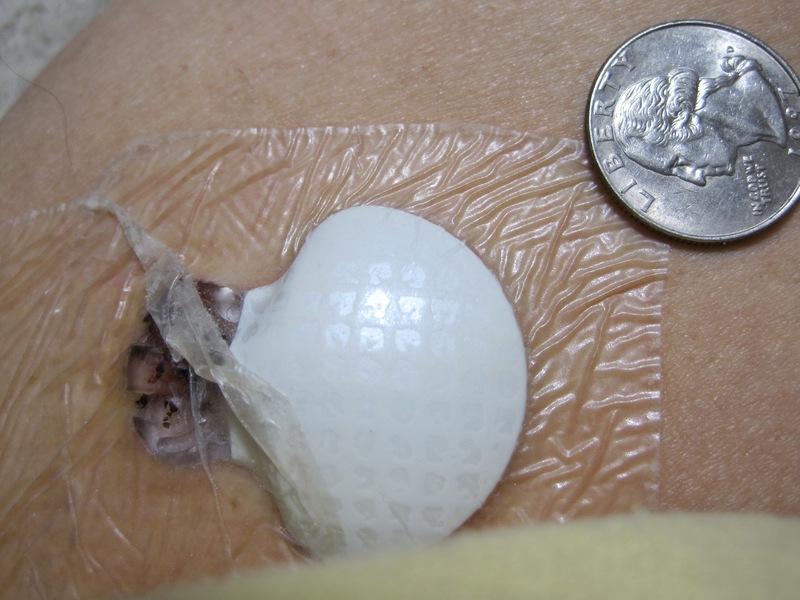 The pump gradually pushes that insulin out very fine tubing a couple of feet long to a set, which is fastened to my body by a piece of adhesive and has a fine Teflon cannula piercing my skin and delivering insulin into the subcutaneous tissue. The set has a needle which is used to insert the cannula under the skin, and is then removed. The set has to be changed every three days – any longer than that in the skin, and scar tissue starts to build up and insulin no longer gets through. These sets are not reusable; in fact they become medical waste. I’m lucky to have very good supplemental insurance as well as Medicare, and every 3 months I get shipped 30 sets. A couple of weeks ago the shipping company called me to check how many sets I had. I have them ship to my doctor’s office, because in my experience mail order pharmacies never adequately package temperature-sensitive medications being shipped to regions where 40-below temperatures are common, and in some shipments I get continuous glucose sensors which must not be frozen. So I called the clinic, which usually calls me when a package arrives for me. They couldn’t find the box. By that time the pharmacy was closed, so when I called back the next morning I got the details of the shipment. They insisted it had been signed for at the clinic and gave me the exact time and date of delivery. The mail order pharmacy said that Medicare rules did not allow them to send out a replacement shipment – never mind that it was the clinic, not me, that verified I had never received the sets that are essential to my life, or that the clinic was willing to pay for the replacement shipment. The clinic combed the offices of the doctors that treat diabetes, and managed to come up with a few sets to tide me over. They also called the pump (and set) manufacturer. The manufacturer FedExed me a few more sets. Finally, Thursday, the clinic called and said they had the sets from the manufacturer, and I picked them up yesterday. I realize that Medicare does have a huge fraud problem. But in this case the clinic was offering to pay for the lost shipment, so what kind of fraud did they think was involved? It’s not as if the sets were valuable to anyone else, but they are life or death to me. 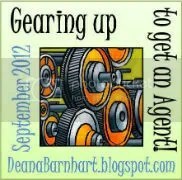 One of the things I blog about is health and health care. 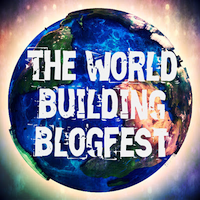 Here are links to posts on this topic. 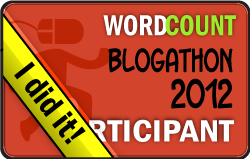 This post will be linked from the Index page, and I will add new posts as they go live. That particular acronym, standing for Your Mileage May Vary, is all too common on the insulin-pumpers’ website. I had first-hand experience of this when a doctor, pre-pump, tried to put me on what he called a sliding scale of insulin, and gave it also to nurses in the local hospital. They insisted on using his scale when I was in the hospital for something else. I looked at the dose of insulin they insisted was necessary when my blood sugar was a little high at bedtime, and said “that’s going to put me into insulin shock.” They insisted on giving me the dose anyway. Luckily insulin shock still woke me up back then, and at 3 am I woke up shocky, hit the call button, and demanded a snack for insulin shock. They insisted on checking my blood sugar first, which only confirmed what I had tried to tell them earlier. I know now that that particular sliding scale, which was probably worked out for the average diabetic of my weight, simply did not work for me. I am very insulin sensitive, and while I absolutely need insulin and will see a very fast and uncontrolled rise of blood sugar without it, I need a very small amount, given my weight. It isn’t just person-to-person differences, either. It can be time of day, time of month, stress, air bubbles, absorption rate of injected or infused insulin, or just the natural cussedness of the universe. Sometimes it can be how what you eat gets into your bloodstream. Your blood sugar does not rise the instant you put carbohydrates into your mouth. The food has to be chewed and swallowed, as almost nothing is absorbed directly from the mouth or esophagus. It has to reach the stomach. One of the side affects of diabetes in many people is gastroparesis, which is delayed passage of food through the digestive system. To further confuse the person trying to keep diabetes under control, this delay is highly variable. As a general rule, food I eat at breakfast time gets into my bloodstream, as glucose, fairly quickly. I’ve taken to eating yogurt for breakfast because most of the carbohydrates are lactose, which absorbs fairly slowly, and because the relatively high protein content also slows absorption. At noon my food absorption is a little slower, and by dinner time it’s slower yet – slow enough I normally spread my insulin out over 4 hours or so. Changing my eating habits, as I did two days ago for Thanksgiving dinner, can cause an unexpected change in how fast the dinner actually gets into my bloodstream as glucose. I didn’t have a huge dinner, or an unbalanced one, but I had more than normal, and upped my pre-meal insulin to compensate. I kept to a four-hour dual bolus, but by the time we went to another house for dessert, my blood sugar was running low. We had pie for dessert. I had a small piece, and I was still low, but I did take more insulin to balance the pie. By the time I got home I was well into insulin shock, with a blood sugar below 50, and over the next two hours I ate enough to bring it up to normal by bedtime. Four hours later my blood sugar was over 300. I’m pretty sure that what happened was that the relatively large dinner caused more than the usual delay between swallowing food and the actual rise in blood sugar. As a result the amount of insulin I took, which was reasonable for the amount of food I ate, was enough to put me into insulin shock. Later that night the food caught up with the insulin, but by that time I had eaten enough extra to treat the shock earlier that my blood sugar went high. The only way a doctor can prevent this is by insisting that you eat exactly the same meals at the same times every day. But we’re people. Most of us can’t keep up that kind of regime. And if we don’t accept that rigid a regime, we have to be intelligent enough to treat ourselves, to a certain extent. I’ll probably do the same thing for Christmas dinner. But I’ll know to spread the insulin out over more than 4 hours. The blade to my food processor. That black is supposed to be all one piece. Disaster struck as I was preparing to start the salad for Thanksgiving dinner — the chopper blade on my food processor is broken. It was fine when I put it away, but now the plastic that holds the blade to the processor is shattered. Guess I’ll have to use the old mini-chopper for the cranberries and chop the rest of the stuff by hand. 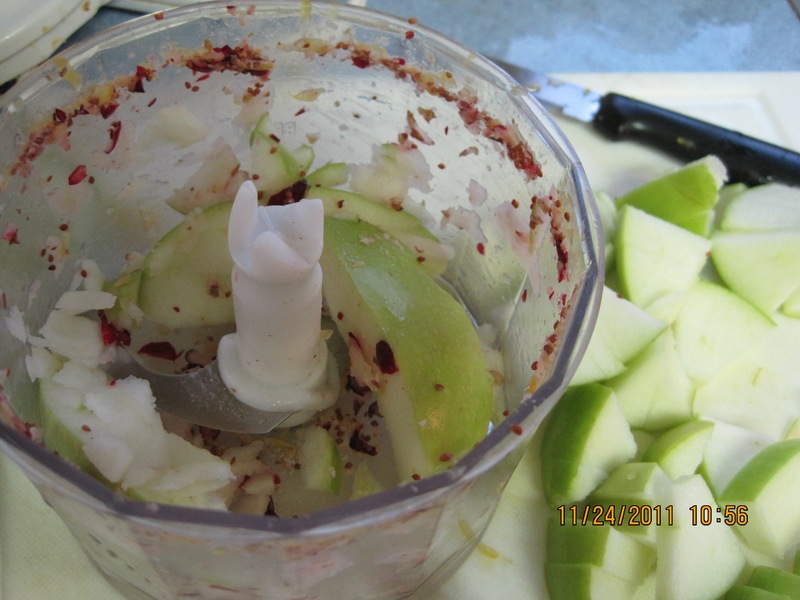 Here’s a photojournal of the process of making the salad without a food processor. 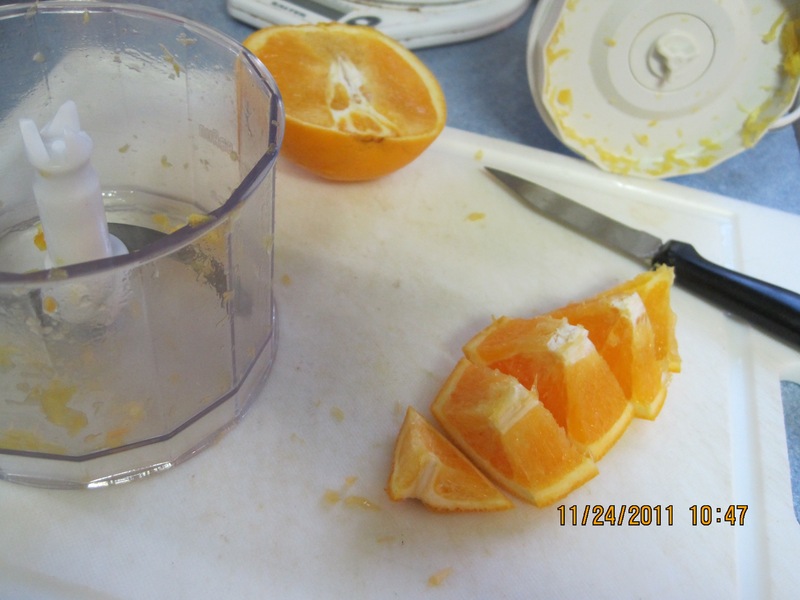 Turned out the mini-chopper did help with the oranges, too. 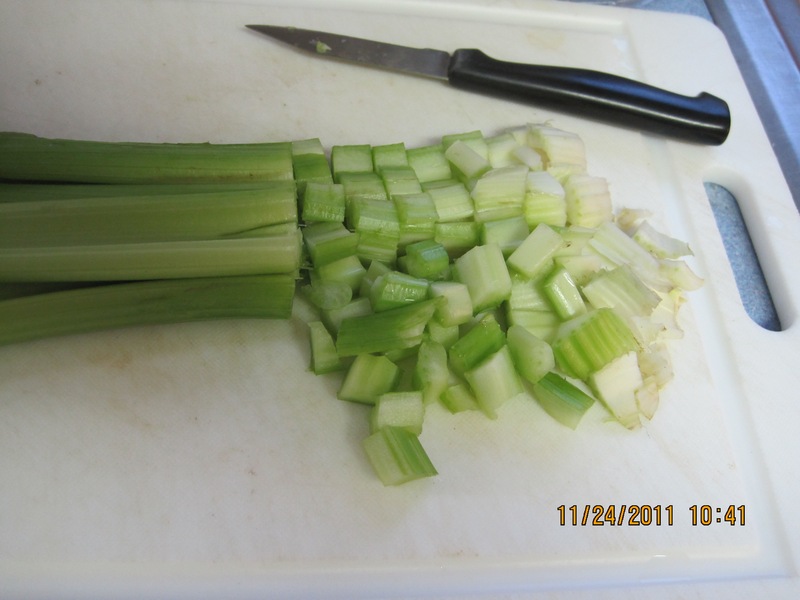 Chopping celery's not that hard--just make a few cuts lengthwise before you start. Yes, the whole naval orange is cut up. 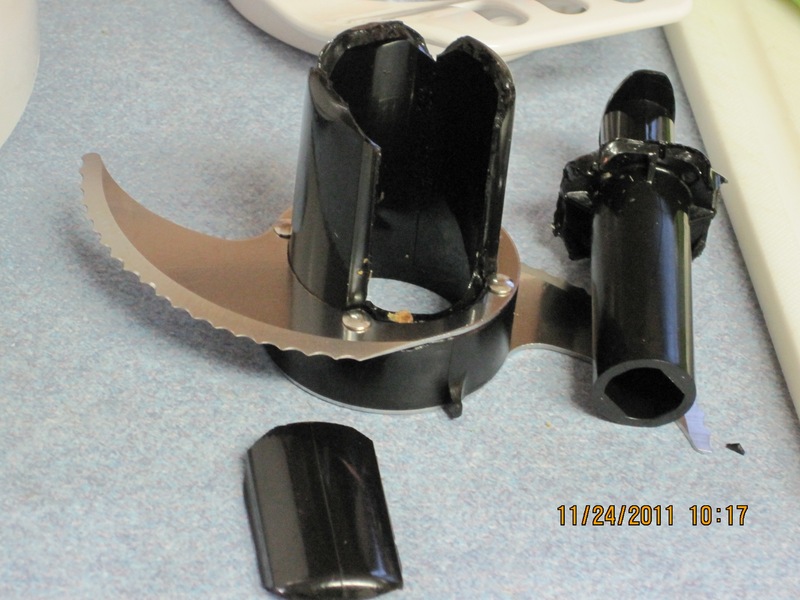 The mini-chopper took it down to small pieces. 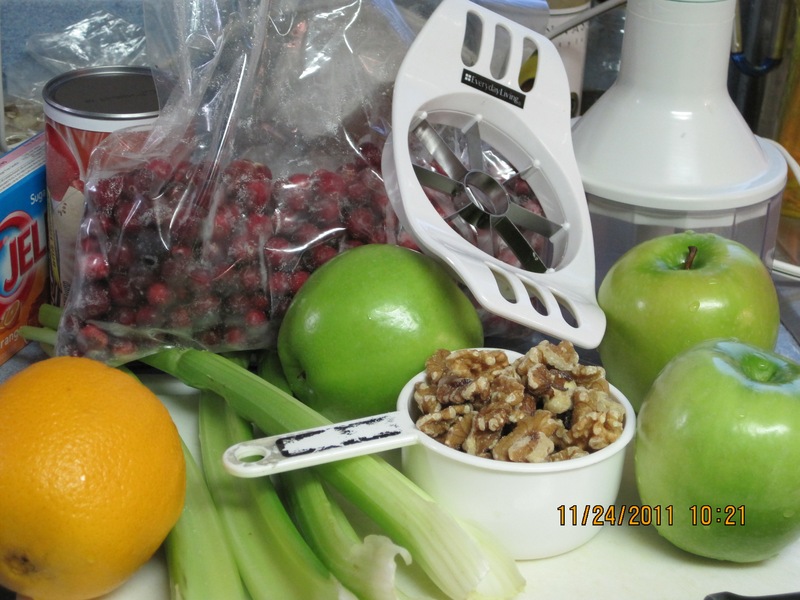 Frozen cranberries and nuts help each other in the mini-chopper. 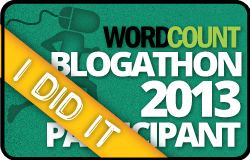 It took three rounds, though. The mini-chopper could not handle the apple wedges, so I had to chop them by hand. Apples were left to last, when I started heating the apple juice and water for the Jello. The finished salad, ready for the refrigerator. It’s anything-goes-day as well as Thanksgiving, so I thought I’d share a couple of my favorites. After all, they go well with turkey leftovers, too. 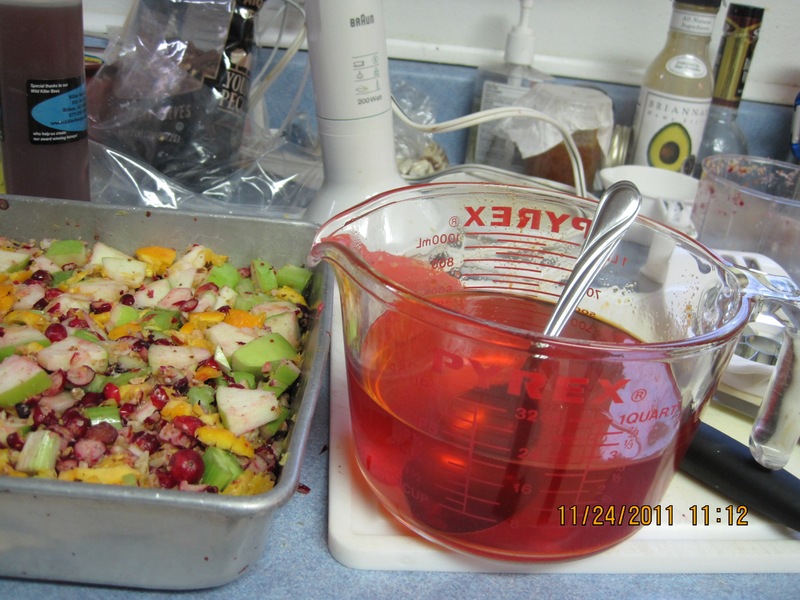 The first is my mother’s recipe for a Jello salad, modified to avoid added sugar and take advantage of a food processor. Note that while the usual Jello salad is Jello with fruit in it, this one is fruit, nuts and vegetables with a little Jello holding it together. 3 cups raw cranberries, washed and (preferably) frozen This is one 12 oz bag. Heat the water and apple juice concentrate together to boiling, and dissolve Jello. 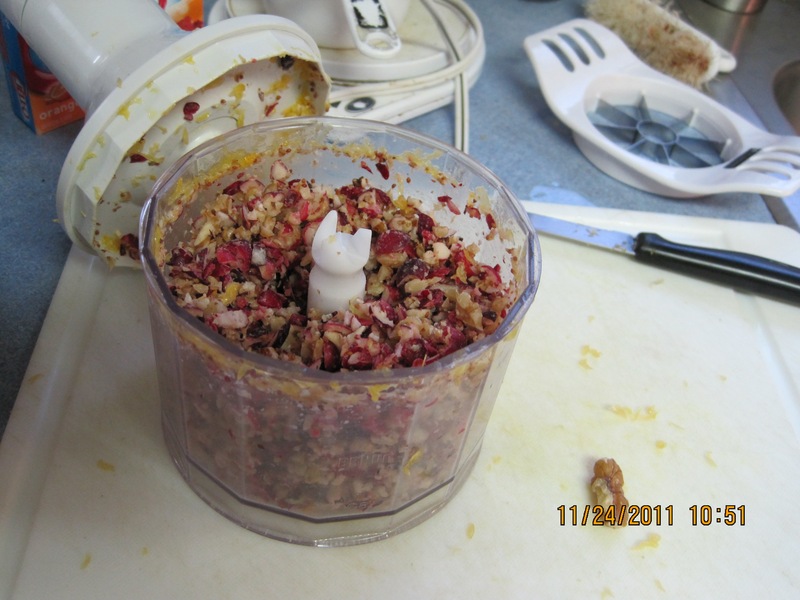 Meanwhile, use the food processor to chop (coarsely) the remaining ingredients. (It may take several batches.) 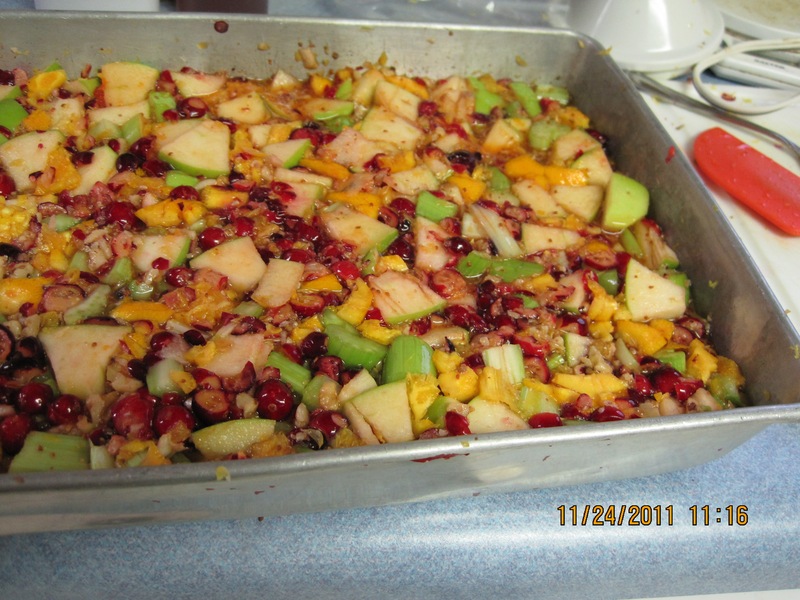 Place the chopped ingredients in a 9” x 13” pan, level them, and pour the dissolved Jello over them. Mix and level to get all of the chopped ingredients below the liquid, and chill until set. Don’t laugh at the gram measurement – when I eat this I weigh the portion, and I use the carbohydrate and and half the protein to figure my insulin dosage. The recipe may have no added sugar, but with all the fruits and the apple juice concentrate, it’s far from sugar-free. A half recipe would probably fit nicely into an 8” x 8” pan; I’ve just never tried it that way as this is my regular contribution to potlucks and Thanksgiving dinners. The second recipe isn’t mine and is probably quite familiar to NPR listeners, but here is the link to Mama Stamberg’s cranberry relish. It may sound strange and look like Pepto-Bismol, but it’s yummy. I freeze it in an ice cube tray. This is a bit of flash fiction, written in the Summer Arts Festival. The assignment was to write a conversation between two people who don’t understand each other, one of whom has some kind of dominance over the other. I’d call this a dysfunctional school, but this sort of incident can happen–we’ve had similar accounts on the insulin-pumpers e-group. The boy–what was his name? Jerry? Jimmy? Jimmy, that was it–refused to meet his eyes and scuffed his right foot on the floor. “I ain’t done nothing. What you want to go pickin’ on me for?” He shoved his hands in his pockets and turned his head, pretending to study the books on the wall. Jimmy backed up a step, and his hand tightened around the phone in his pocket. “Don’t have a cell phone.” Sweat began to bead on his forehead. “No!” Jimmy backed away another step, his eyes flickering to the closed door. Furious, Cyril lunged toward the boy, grabbing the object the youngster held and pulling it away. It was tethered by a cord to the pocket, and he jerked it free and threw it down. He heard it smash as it hit the floor. Cyril took the smashed electronics from the boy’s unresisting hands, and suddenly saw the words in the back of the case. 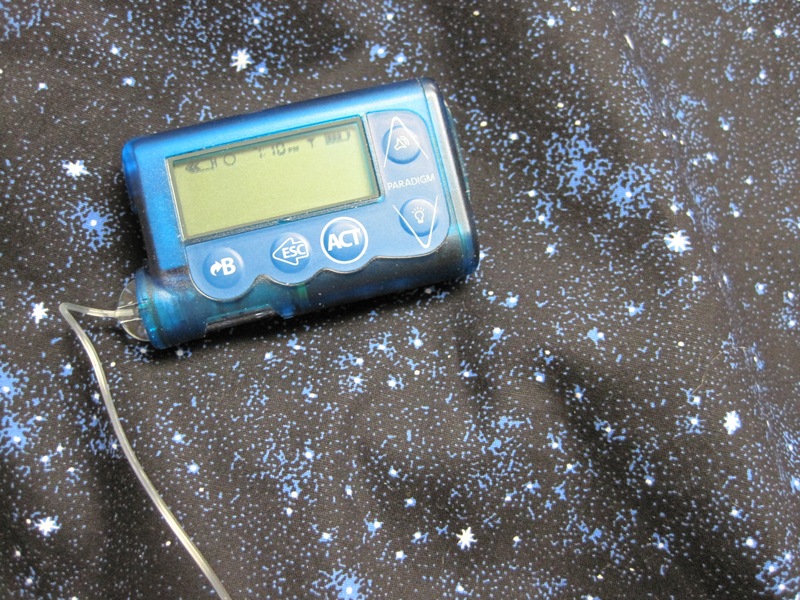 Insulin pump. Why is health care growing steadily more expensive? Well, there are quite a lot of reasons. But the most obvious to me, the elephant in the room (and I’d don’t mean the GOP elephant) is something never mentioned by politicians. What’s more, we all cheer it on. I mean the advances in medical science. Face it. One of the man reasons medicine is costing more and more is simply that doctors can do more and more. Take my own case. A century ago, I would have died before getting my Ph.D., and the most a doctor could have done was tell me that I had diabetes and it would kill me, painfully, probably within a year if not a few weeks. Oh, my life could have been somewhat extended by a starvation diet, but I wouldn’t have lived long, and I probably would not have stacked up much medical cost. 42 years ago, when I was diagnosed as having diabetes, there was a treatment, insulin. It was cheap—a slaughterhouse byproduct. Hypodermics were glass, and my fingertips were often scalded because those glass syringes had to be taken apart and boiled before each use. Blood sugar tests? Those were carried out in a laboratory, and took several hours. Urine tests were available, but it didn’t take me long to realize that I could have urine sugar so high the tests would scarcely read it while I had every physical symptom of blood sugar so low I almost passed out. 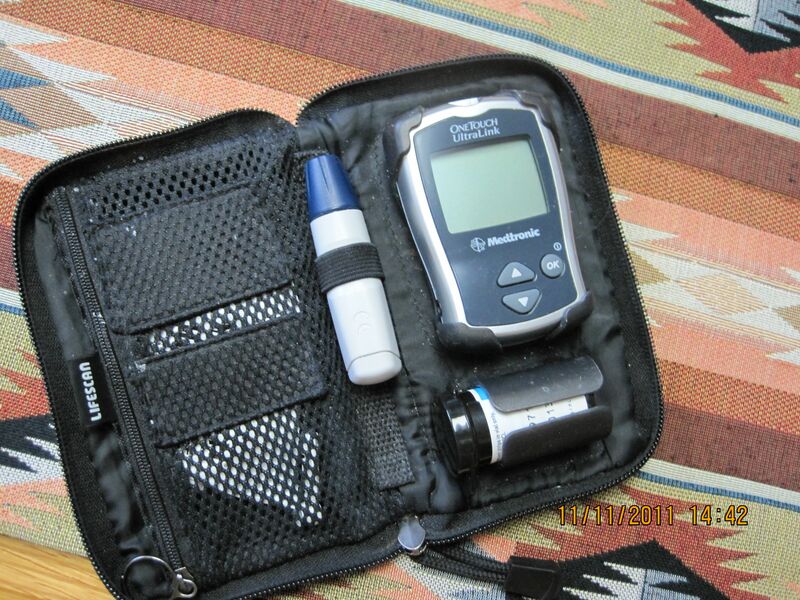 The medicine of the time kept me alive, but my diabetes was not exactly well controlled. Probably my eye problems today can be traced in part to this poor control. Since then I have gladly discarded the glass syringes for disposable plastic, swapped beef-pork insulin for genetically engineered (and much more expensive) human insulin, learned to test my blood sugar with a finger prick, begun using artificial insulins genetically engineered to act faster and slower than human insulin, started using an insulin pump, and added a continuous blood sugar monitor. My diabetes is under far better control, and in fact my blood sugar is usually within the normal range. Thank goodness I have good insurance, because all of this is appallingly expensive. Diabetes is by no means the only disease to see this kind of improvement in care at an increase in cost. Many cancers that were once fatal or “curable” only by gross mutilation can now be treated with far less invasive surgery, drugs and radiation. More and more conditions that were once a death sentence can be treated, even if few can be really cured. And as one result, medical costs have skyrocketed. People for whom nothing could be done are now treatable.